Summer is over and it’s time to start discussing Christmas! Okay, maybe not yet. But some holiday packaging markets are already preparing for the snowy season ahead. One yuletide tradition you can expect to see a little early is the Elf on the Shelf thanks to a little help from Sunrise Packaging. If you’re not familiar with Elf on the Shelf–well, where have you been? Apparently not on Facebook. According to just about any family’s photo uploads, the seemingly timeless tradition of a rambunctious Elf (hailing from the Shelf) carries on year after year. This mischievous little critter appears to be the scapegoat for a wide variety of good-hearted, Toy Story-esque pranks around the house. But how exactly does the Elf get on one’s shelf? That’s where holiday packaging comes in. The (in)famous history of the Elf on the Shelf can be traced back to 2004. Over a cup of tea, an erstwhile mother-daughter duo decided to make a time-honored family tradition into a global phenomenon. Legend has it that Santa dispatches helper Elves around the world come December to keep an eye on families and make sure that the holiday magic is running high. This is the reason the Elf is often caught off the Shelf in a covert location. What results is a month-long game of hide and seek and, more importantly, a tradition the whole family can take part in. But the Elf has to get delivered somehow and apparently Santa thinks holiday packaging is the best vehicle (other than the sleigh, of course). This beautiful custom box crafted by Sunrise Packaging. A 4-color printing finished with an eco-friendly aqueous print coating displays the warm colors of the season. 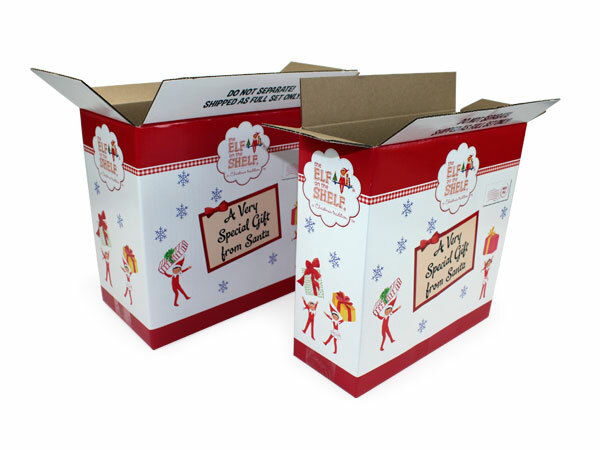 These custom RSC boxes are made of B-Flute corrugated cardboard for a combination of durability and cushion, holding up in transit as well as storage between holiday seasons. Sunrise was able to deliver on this holiday packaging just a week after art approvals. At that rate, Christmas could almost come twice a year! 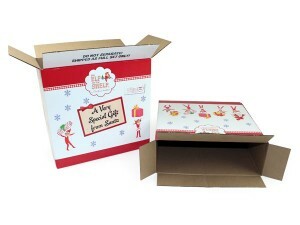 In any case, the Elf on the Shelf custom box was a pleasure to work on. A truly lovely piece of holiday packaging that will hopefully be a part of your family’s traditions this Christmas season. You can almost taste the eggnog, can’t you?